We take water from wherever we can. From our rivers, ponds, lakes. From the ground, drawn through hand pumps and wells. In return, we give back waste. About 80 per cent of all the water we use comes out as wastewater. Much of this wastewater is spilt out into our water sources (rivers etc), or on to our land – polluting both. Through the land, our groundwater too gets contaminated. In this way, we are spoiling a natural resource without which we cannot survive. We do not pause to think that tomorrow, we may not have enough to drink. The right to water is really the right to life and livelihood. Just as we cannot live without water, a country cannot survive if it is water-stressed. This resource determines our future, and acts as a driving force for our economic growth. Agriculture is the biggest user of water. According to the Union Ministry of Water Resources, more than 85 per cent of the country’s ‘usable’ water-including groundwater and surface or river flow—is allocated to farming. Yet, 67 per cent of India’s total cultivated area remains rain-fed, or outside the purview of the ‘official’ irrigation network. Of the 141 million hectares (mha) of net sown area in the country, 78 mha are rain-fed, and regarded as a high-risk venture. The situation is particularly alarming because demand from other quarters-domestic and industrial-is rising at an unprecedented pace. It is obvious that the country’s water-use pattern, initiated by stunningly short-sighted management systems, has gone completely awry. In Punjab, farmers are provided with free electricity to help in irrigating their fields; this electricity is often misused, leading to water mismanagement and wastage. Even today, the government admits to ‘not being able to provide’ safe drinking water to more than half the country’s population. Poor sanitation and unsafe drinking water account for a substantial part of the disease burden in India, contributing to diarrhea, cholera, typhoid and jaundice. But the key issue of water is not its scarcity. It is about its careful use and fair and equitable distribution among the users. THE REAL WATER CRISIS INDIA FACES TODAY IS NOT ABOUT SCARCITY PER SE BUT MANAGING COMPETING NEEDS, WHICH ARE NOW ERUPTING INTO CONFLICTS AMONG USERS AND OFTEN TURNING VIOLENT. The fact is that urban areas and industrial centers in India are now sucking up much, much more than their legitimate share and overburdening available water resources. Cities across the country need more water for their growing populations and, more importantly, growing affluence. So they are sourcing it from further and further away. Delhi, for instance, is getting water from the Tehri dam, over 300 km away in the Himalaya; Bengaluru from the Kaveri, about 100 km away. Every city is getting thirstier-and the problem is that they are encroaching upon the territories of the rural population. The real water crisis India faces today is about managing competing needs that are erupting into conflicts among users, often turning violent. When Chennai decided to tap the Veeranam lake for drinking water, farmers who live around the lake and use it as their main supply source took to the streets. Some answers to this crisis lie in our traditions, in the hands of our people. In the past, water was managed locally, and at a pretty low cost. Administrative units comprising local people decided how it would be shared and distributed and penalised over-users and usurpers. The system ensured fair and equitable access to water and a stable economy. It is time to remodel the present centralised management system. The Indian Standards Institute (ISI) has laid down guidelines for adequate sanitary facilities (see Table 1). Based on these ISI standards, we have evolved some norms (see Table 2) that will be more practical for schools to follow. Ablution taps 1 in each water closet and 1 water tap with draining arrangements shall be provided for every 50 students or part thereof in the vicinity of water closets and urinals. It is well-known that Delhi, like most metropolitan cities, is struggling to meet its water demand. To make matters worse, this shortage is being bridged through illegal withdrawal of groundwater. Unregulated overuse has led to groundwater levels plummeting three times faster over the last 60 years, leading to water scarcity. Rainwater harvesting can solve the crises in cities that face acute water shortages. Ironically, Delhi was one of the first cities to amend its by-laws to accommodate rainwater harvesting in 2001. But due to lack of implementation, about 85 per cent of the total run-off generated in the city goes waste as it flows down storm-water drains that are meant to carry rainwater. Take responsibility: We need to be competent, conscientious and committed water citizens. But if we are to attain our right over water, we have to take up some responsibilities ourselves. The GSP is the first step towards this. To come up with a plan to save water, it is important to know how much water your school actually uses. To find total consumption, monitor water consumption over three non-consecutive working days spread over one month and take the average. For example, you can monitor the water consumption on 3 August, 13 August and 23 August. Add all three total consumptions and divide the total by the number of days of observation (i.e. three days). You will get the average per day water consumption. Bill method: If the school’s water meter is monitored regularly—water bills by the government/municipality state the actual amount used-students can simply compile bills to assess total consumption. Monitoring overhead tanks: If the bills are irregular and incorrect, then monitor the overhead tanks. Note the difference in levels of water in your overhead tank between the beginning and the end of the day. Ensure that the tanks are full when the day begins. Check the water level when school is over by noting the difference in levels of water. Estimate consumption. Motor method: If your school uses groundwater, take a bucket. Note down the measurement of the bucket and then switch on the underground water pump. Let the water run out of the hosepipe into the bucket. Check how long it takes to fill up the bucket. You can now calculate the flow of water in litres per minute. Find out (from the gardener or other administrative staff) the number of hours the pump motor runs per day. Multiply the number of hours the motor runs by 60 so that you get the number of minutes the motor runs. Again, multiply the number of minutes the motor runs by the amount of water that comes out from the hose pipe in a minute. The administrative staff and the plumber would be helpful in gauging this. Conduct an audit for two or three days and then take an average to find the total consumption. WHAT IS THE SOURCE OF OUR WATER? It is important to know the source of water in your school premises. As you know, most cities in India have to deal with depleting water supplies marked by falling groundwater levels, vanishing water bodies, severe pollution and urban floods. A hundred million people in India live in areas with poor water quality; 40 per cent of India’s groundwater in Uttar Pradesh, Bihar, West Bengal, Assam, Rajasthan, Punjab, Haryana and Gujarat (some of our most populous states) is contaminated. With their own supplies drying up, cities are forced to source water from further and further away – but this is an expensive option. CONSULT THE SCHOOL ADMINISTRATION AND THE BUILDING PLAN FOR DATA ON TOTAL AREA OF THE SCHOOL INCLUDING ROOFTOP AND PAVED AREA. HOW DO WE CONSERVE WATER? The first and the simplest step towards water conservation is mending any leak or crack in the taps and pipes in the school. Even a small leak could cause an extensive amount of water loss and mean more money added to the water bill. The toilet flush system is another major factor that needs to be considered for water conservation. Typically, an Indian household uses five liters of water per person per day for cooking and drinking but every time you flush your toilet, you use up to 9-12 liters of water! Imagine the amount of water getting wasted. If you replace the flushing system with a dual system, then you save at least five liters of water every time you flush. The school garden also consumes water, sometimes a lot depending on the area it covers and the type of plants that are grown. Sticking to indigenous variety of plants and less water-requiring plants, like xerophytes, not only increases the aesthetic beauty of the garden but also goes a long way in water conservation. While watering the plants, ask your gardener to avoid watering the plants either very early in the morning or very late. early watering and late watering as it leads to water loss due to evaporation — water the plants during the later morning hours. The best way to water plants is to focus on the root zone. India receives ample rainfall. The best way to conserve and replenish our water sources is by harvesting rainwater. Rainfall (precipitation) is the primary source of freshwater on land. Do you know how much rainwater your school can catch, and how much it can harvest? Every region in India has age-old local traditions of water harvesting. The method or structure used depends on the soil, terrain, geological formation and rainfall pattern. Rainwater harvesting is a traditional, time-tested method of collecting rainwater and using it to recharge groundwater or storing it for other uses. CSE has been promoting the concept of water harvesting, particularly in urban areas, as a technological solution that can be adopted by all. Rooftop area: This is the roof of your school building. Most rainwater that falls on its surface runs off. Almost 85 per cent of it flows down the pipes. The remainder is lost in evaporation, absorption and other losses. Paved area: These are the semi-hard surfaces of your school paved with stones, tiles, gravel. This includes your driveways, basketball courts etc. Almost 70 per cent of the rainwater from this area runs off. Unpaved area: This is the soft open surface of your school – lawns and playgrounds. The ground absorbs a huge amount of water, allowing only 30 per cent to run off. Storage tanks for harvested rainwater can be built both underground or on the surface. In the cities of Gujarat and Rajasthan, where rooftop rainwater harvesting was practiced traditionally, rainwater from the roof was collected in underground tanks in the courtyard or within buildings. Called tankas, these storage structures would supply drinking water throughout the year. Some are still in use today. In the north-eastern state of Mizoram, tanks made of galvanized iron, tin or concrete are commonly used to store rainwater for drinking purposes. These are all built on the surface perched on roofs or on the ground besides the houses. MAKE SURE THAT THE SCHOOL’S OVERHEAD TANKS ARE COMPLETELY FULL IN THE MORNING, THEN CHECK STATUS IN THE EVENING TO ASSESS DAILY WATER CONSUMPTION. Recharge structures channelise rainwater into the aquifer. It is an absolute necessity in view of the rapidly declining groundwater table across India. Recharging also prevents flooding in cities during intense rain spells. In coastal areas, it serves to control saline water intrusion. For data on average annual rainfall in your area, check the internet or call the local meteorological department. 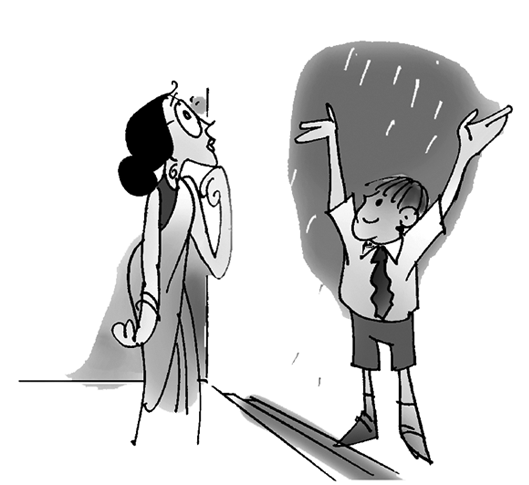 Schools can approach the India Meteorological Department to get rainfall data for their city. The Central Ground Water Board also comes up with a district report (www.cgwb.gov.in). Schools can also go to www.rainwaterharvesting.org and search for ‘Rainfall data for major cities of India’. Another way of conserving water is by recycling it. Water recycling is the process of treating wastewater in order to upgrade its quality, so that it can be used again. For example, if you wash vegetables and then pour the used water into a flowerpot, it would be considered reuse. RAINWATER HARVESTING: WHAT IS RUN-OFF? Run-off is the term applied to the water that flows away from a catchment after falling on its surface in the form of rain. Run-off can be generated from rooftop, or paved* and unpaved catchment areas of buildings. The nature of the catchment determines the quantity of run-off that is collected from the area. For example, about 85 per cent of the rain that falls over the tiled surface of a terrace would flow as run-off. In unpaved areas, only 30 per cent of the rainfall on a wooded or grassy area would flow; the rest would be retained on the surface and percolate into the ground. As paved areas are semi-hard, 70 per cent of the water is available as run-off. From the point of view of quality, run-off can be divided into three types: run-off from rooftops, paved and unpaved surfaces. Quality of run-off from rooftop is the cleanest, followed by paved surface. The run-off from unpaved surfaces may have bacterial or other contamination. If water is to be stored for drinking purposes, it is advisable that only run-off from rooftop surfaces is used. Note: *While finding out the rainwater harvesting potential, we multiply the equations with 0,80, 0.60 and 0.10 in order to take into consideration absorption, evaporation and other losses. Source: Anon. 2003, A Water Harvesting Manual, Centre for Science and Environment, New Delhi, p. 6. WHAT IS A RECHARGE WELL? Should have a depth of a recharge well within 5 metres of the water table. Should have a minimum diameter of 0.1 metres, a casing of slits, and be filled with grit. Should have a proper recharge pit on top. Should be big enough to hold surface run-off from an area of 500 square metres. Should have a recharge bore inside the recharge well to carry collected rainwater to underground aquifers. A recharge well for an area of 500 square metres will have the capacity to hold 3 to 4 cubic metres of water. Rainwater harvesting for groundwater recharge: Divert run-off with help of pipes or drains to the inflow of recharge well. The school increased the amount of wastewater reuse from 9,000 litres to 22,240 litres after its first audit corrective session. Three years into the programme, it installed solar panels to cut down on the school’s energy cost incurred in the kitchen. A drought-prone location spurred the school to harvest scanty rainfall to its full potential – 16 litres of freshwater was made available for each member of the school community as against the BIS (Bureau of Indian Standards) norm of 13-17 litres. Grey water is the used water from bathroom sinks, showers and washing machines that is not contaminated with excreta or urine. Several residential schools in Dhar and Jhabua districts of Madhya Pradesh have installed grey water treatment plants with help from the government and non-government agencies, to combat shortage of water. Grey water treatment plants work on simple treatment techniques, such as screening, equalisation, settling, filtration and aeration. Treated grey water can be used in cleaning floors and toilets, gardening and watering lawns. For example, the Girls’ Ashram School in Kokwad, Jhabua, has a grey water treatment plant. The per capita consumption of water in this school is 40-50 litres a day. Of this, 5 litres per student per day is used for drinking and therefore cannot be reclaimed. The rest of the water is treated using the treatment system. What About the Plumbing and Sanitation Facilities? Hygiene and sanitation facilities are vitally important for a child’s health. Lack of these hampers attendance, especially of girls in senior grades. According to the World Health Organization (WHO), 748 million people lack access to improved drinking water and it is estimated that 1.8 billion people use a source of drinking water that has faecal contamination. Improved sanitation facilities are likely to ensure hygienic separation of human excreta from human contact. They include flush/pour flush (to piped sewer system, septic tank, pit latrine) systems, ventilated improved pit (VIP) latrines with slab, and composting toilets. Proper maintenance of leakages in taps and pipes along with regular inspections from a plumber or water specialists will help in detecting any problems quickly and easily in the school. This will also help a long way in water conservation. A substantial amount of water can be saved and reused, at minimal cost, if some simple precautionary measures are taken to prevent wastage. Out of 15, 00,000 billion litres of water present on Earth, only 12,500 to 14,000 billion litres is available for human use annually1. By 2050, of the projected global population of 9.4 billion, 4 per cent will face water stress or scarcity3. According to the World Resources Institute’s March 2016 report, 54 per cent of India is water stressed. Water is unequally distributed in different areas in India. For example, Rajasthan state, with 8 per cent of the country’s population has only 1 per cent of its water, and Bihar with 10 per cent of the population has 5 per cent of water4. Close to 650 major towns and cities in India are on the banks of rivers contaminated with pesticides from farms and effluents from industry, says a latest report of Central Pollution Control Board. Of 660 districts, groundwater in 276 has high levels of fluoride; 387 districts have nitrate above safe levels and 86 have arsenic, shows data from the Central Ground Water Board’s latest report. India is the largest user of groundwater in the world. It uses an estimated 230 cu.m. of groundwater per year ╤ over a quarter of the global total5. The World Bank estimates that India, which comes currently under the ‘water stress’ classification (1,000 cubic meter per year) will be pushed to the water scarce classification (1,700 cubic meter per year) by 2030, if groundwater exploitation continues. 100 million people in India live in areas with poor water quality6. 21 per cent of communicable diseases are caused by unsafe drinking water7. 40 per cent of water in UP, Bihar, West Bengal, Assam, Rajasthan, Punjab, Haryana and Gujarat is contaminated8. The major cities which pollute the river Ganga are Kanpur, Allahabad, Varanasi and Patna. The river receives 600 million litres daily (MLD) of wastewater from both domestic and industry sources in Kanpur; from Allahabad the river receives 176 MLD of wastewater. From Varanasi and Patna, it receives 410 MLD and 279 MLD of wastewater respectively9. Centre for Science and Environment (CSE) defines biological oxygen demand (BOD) as the amount of dissolved oxygen needed by aerobic biological organisms in a water body to break down organic material present in a given water sample at certain temperature over a specific time period. The Central Pollution Control Board (CPCB) and the State Pollution Control Boards (SPCB) monitor water pollution by monitoring the BOD. Of the one billion people in the world who have no toilet, India accounts for nearly 600 million. More than 72 per cent of rural people relieve themselves behind bushes, in fields or by roadsides i.e. open defecation10. 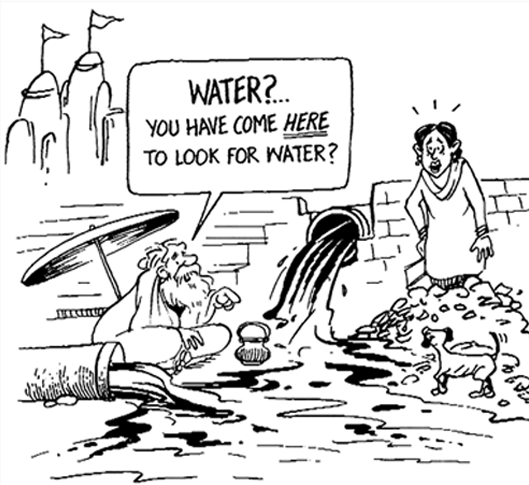 According to the Census of India 2011, three out of every five people do not have access to sanitation facilities. Hand washing with soap, particularly after contact with excreta, can reduce diarrhoeal diseases by over 40 per cent and respiratory infections by 30 per cent. Diarrhoea and respiratory infections are the number one cause for child deaths in India11. Mass bathing in a river during religious festivals is another environmentally harmful practice. Studies have revealed that the BOD goes up drastically when thousands of people simultaneously take a holy dip. A rise in the BOD means the water is getting polluted12. Dams are planned and built for water storage and abstractions (mainly for agricultural and urban use/consumption), hydropower, navigation and flood protection. While many dams have brought significant benefits, they have also caused environmental damage. Sardar Sarovar Dam is a prime example that holds out the chimerical promise of material wealth through modernisation but perpetuates an unequal distribution of resources and wreaks social and environmental havoc13. India is using only 35 per cent of the rainwater it receives. If rainwater harvesting projects are effectively implemented, 65 per cent of the rainwater which is wasted can be used14. According to an analysis by CSE, 470 million cubic metre (MCM) of rainwater in Delhi gets collected in drains and gets wasted annually. This leads to an annual average water shortage of 302 MCM. Rainwater harvesting can conserve 560 MCM of water in the national capital of Delhi which will help in solving its water crisis15. Traditionally, people across India built rainwater harvesting structures such as zings, kuls, kunds, bamboo pipelines, anicuts, johads and baolis to get precious freshwater16. ABC of RWH, Gobar Times, March 1-15,2015, no. 162, Down to Earth Supplement, pp.70. Thirsty India Heading for Crisis, Chetan Chauhan, 5-06-2016,Hindustan Times (Projected; Source: World Bank; Water Resources Ministry; NSSO; Current Science and WRI). Thirsty India Heading for Crisis, Chetan Chauhan, 5-06-2016, Hindustan Times (Projected; Source: World Bank; Water Resources Ministry; NSSO; Current Science and WRI). Water and River, State of India’s Environment, 2016, Down to Earth Annual, pp.160-184.